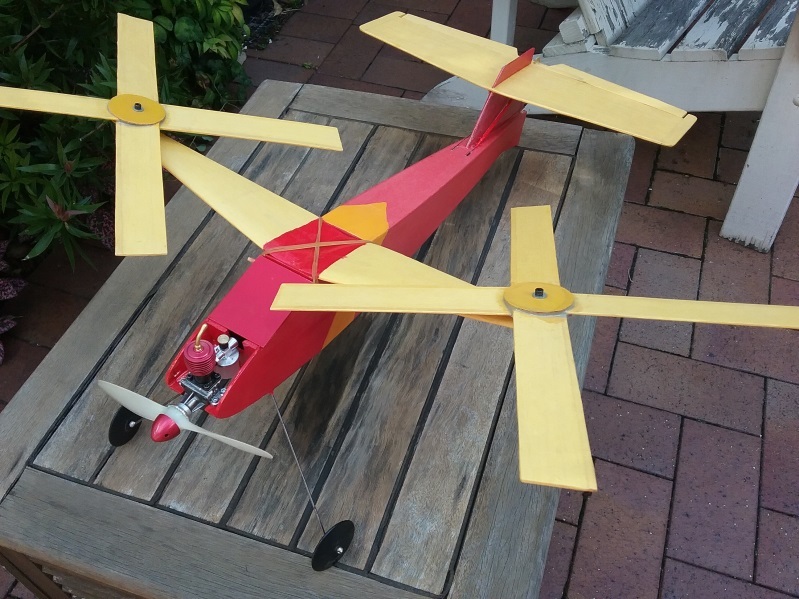 You are here: Home Home Flying the Autogyro - update - success! Flight 1 : I started it (it starts easily it’s a nice little engine) put it on the ground and let go. It shot forward, got an inch (2.54cms for the younger members!) off the ground and turned/rolled rapidly to the left and finished upside down! Flight 2 : suspecting torque from the excessively powerful engine being the cause I was ready to shove in a lot of right rudder on this one. Started engine, released and it shot forward again. It went about 50 feet in a vaguely straightish direction, got about 12 inches of the ground and rolled in again. Flight 3 : Refilled the tank (another 2ccs gone) and off it went again straight across the field reaching an altitude of at least 3 feet! It was during this 4 second flight that it was clear the rotors were not rotoring, it was flying using the “wing” (the support for the rotors) for some lift and finished in the long grass on the far side of the field. Flight 4 : hmmmmm, thinks, maybe it is not getting a steep enough climb angle to the wind to get the rotors to spin, let’s try a lot of up elevator on take-off (did I mention I went wild and fitted both rudder and elevator!). Once again it raced across the ground at impressive speed. It leapt into the air and climbed steeply to about 50feet the rotors whirling in opposite directions just like they should. They were obviously providing lift like they should so I thought I’d better turn to make sure it stayed in the field not in the bush. The turn started ok but rapidly tightened into a spiral dive and ended abruptly at ground level with 2 broken rotor blades. Home for repairs and next time it will be fantastic …….. perhaps! I repaired the rotors, just superglued them back to flat and doped a piece of tissue over the join. It was clearly very sensitive to rudder movement so I reduced it by about half and went back to the field. Flight 4 : I got Stan to film the take-off. It shot forward (it really does accelerate well) and it did a Flight 1 again! Really good piece of video! Flight 5 : ready with a bootful of right rudder off it went. Fantastic! It needed a heap of right rudder, almost full right for the whole flight of at least3 minutes! It was great, the rotors whirled, it climbed to at least 100 feet but was a bugger to steer. The engine cut ……… would it auto-rotate? YES! The rotors whirled on and it came down fast but under some control over direction! This was getting good. Flight 6 : went to sub trim and put in a lot of right rudder. Off we went. Pretty straight run across the field rotors spinning. Up, up and away! I could steer right and left so did some 8s and a few sweeping turns. Applause from all directions! It seemed to come down steeper when the engine cut but bounced with no damage apart from a slightly bent undercarriage leg. Flight 7 : Another great flight, all sorts of swoops and turns! Most pleasant to fly now, can’t wait to get up again and try a loop or a roll? 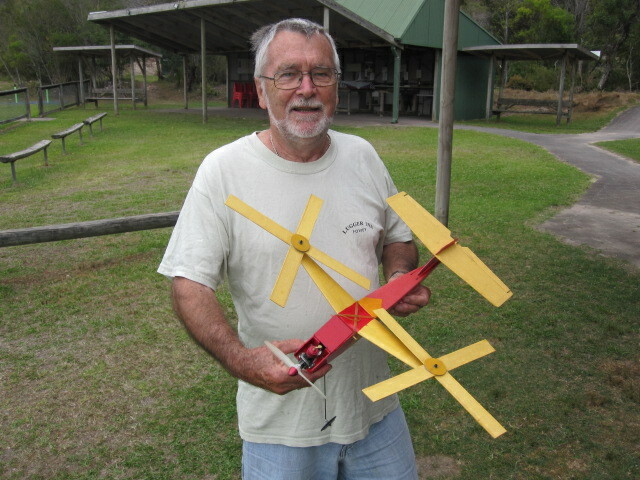 Go build one and join the expanding group, Clive has nearly finished his.